leaders who set course and inspire other to follow their direction. this award celebrates discovery of new frontiers, selfless dedication and pioneer spirit. 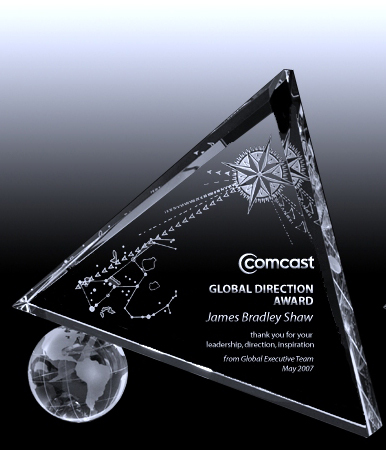 The design features a crystal triangle that symbolizes a sail and a crystal globe supporting it. The top of the sail is decorated with an etching of a navigation compass rose that symbolizes setting a course. In addition the design features Orion constellation which early explorers used to navigate at night. Even when visibility is poor leaders who are set on the right course will steer their organizations to sweet waters of success.